Lakshmi and Kubera both are known as wealth gods who help us lead a wealthy life by destroying financial problems. 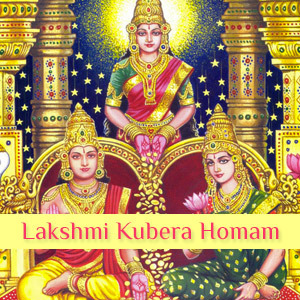 This Lakshmi Kubera homam is performed to get major benefits. This homam is well known as a one of the powerful homam helps to attain more wealth to live an pleasant life. Lakshmi is the bride of Lord Vishnu. She along with Lord Kubera give money to well beloved devotees when they do prayers to her. Date fixed for this homam as per one’s janma star, the thithi and the yoga of that date. Best day to conduct this homam is Friday. This homam is performed specially on dhanteras time and Akshaya Tritiya.